SAN FRANCISCO — Fresh off the fight over debit interchange fees, NAFCU now focuses on a range of other goals, chief lobbyists tell attendees. 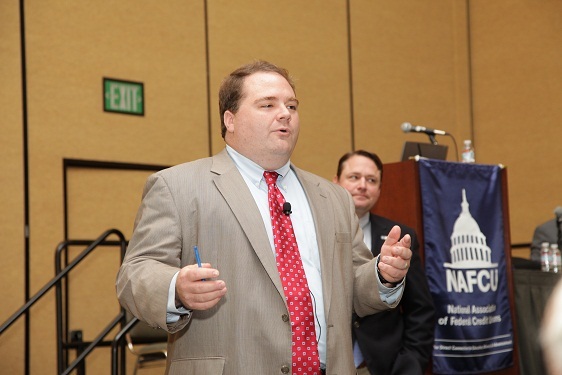 Brad Thaler, NAFCU vice president of legislative affairs, makes a point while Dan Berger, the organization’s executive vice president for government relations, listens behind him. SAN FRANCISCO — Fresh off the fight over debit interchange fees, NAFCU is now focusing its attention on goals such as trying to influence the shape of housing finance reform, preventing the taxation of credit unions and persuading lawmakers to approve stronger rules to prevent data breaches.